German pianist; born at Pless, Silesia, April 12, 1851. After a course in piano at the Neue Akademie der Tonkunst, Berlin, under Ehrlich and Kullak, he continued his studies with Dachs at Vienna and with Liszt at Weimar. In 1867 he went to America, where, until 1871, he taught music in a Kentucky seminary. 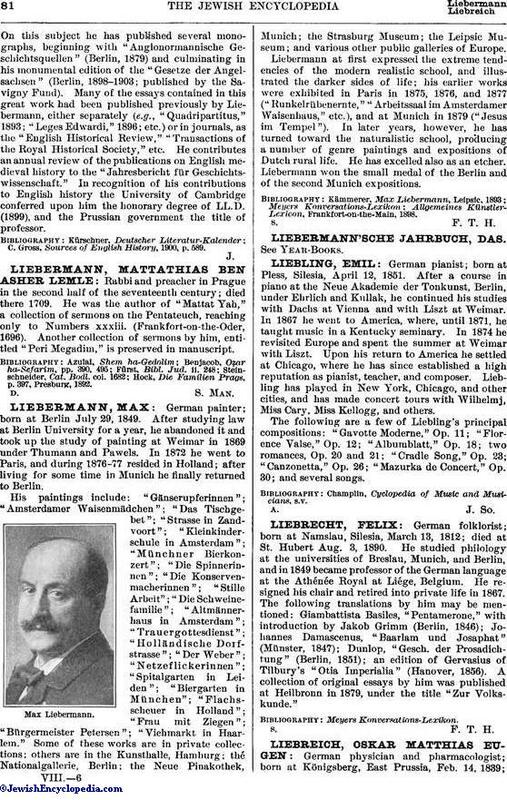 In 1874 he revisited Europe and spent the summer at Weimar with Liszt. Upon his return to America he settled at Chicago, where he has since established a high reputation as pianist, teacher, and composer. Liebling has played in New York, Chicago, and other cities, and has made concert tours with Wilhelmj, Miss Cary, Miss Kellogg, and others. The following are a few of Liebling's principal compositions: "Gavotte Moderne," Op. 11; "Florence Valse," Op. 12; "Albumblatt," Op. 18; two romances, Op. 20 and 21; "Cradle Song," Op. 23; "Canzonetta," Op. 26; "Mazurka de Concert," Op. 30; and several songs. Champlin, Cyclopedia of Music and Musicians, s.v.